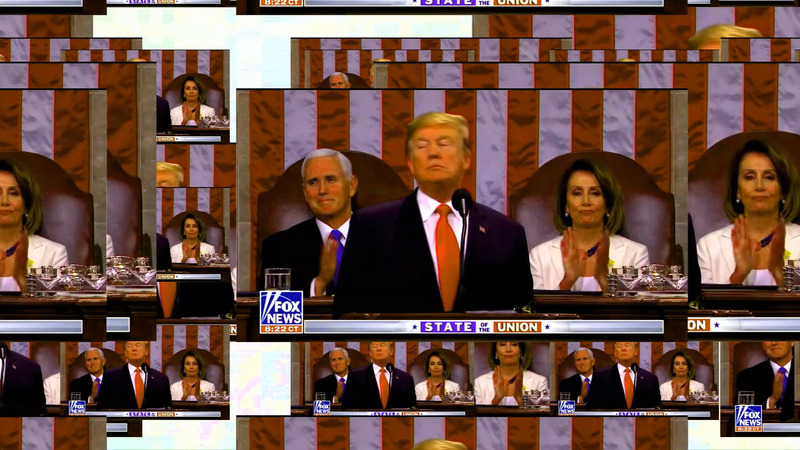 The XTreme TRUMPological post reality we find ourselves in has reshaped congressional decorum, that once hallowed ground for bi-partisan collective dialogue. Now, all is a Show, not that the State of the Union hadn’t already become a postured affair for parading guests with tear-jerk narratives, but now, everyone finds themselves in the act: particularly the masterful TRUMP killer herself, “Nancy,” who just yesterday became even more infamous for her thunderous, man-slapping, “Clap of Sarcasm” meme. This is, of course, all in parcel with the TRUMP Production, in which the master of the Show invites – perhaps “tricks” is a better word – everyone around him into playing a participatory role in his mad schemes. But the reality show format of always-on suspended-disbelief performance art, executed in front and for the camera, has turned every movement, every slight of hand, every glance, into a memetic made for tv ACTION EVENT, instantly and simultaneously, to be replicated, duplicated, and reverberated through the infinitely circulating network of the social media viral brain. This truly is theater for the 21st century: a rampant proliferation of memes and cause & effect viewer response on a global scale with breathtaking speed and velocity. It used to be said that all the world is a stage, now it can be stated, without further ado, that we the People are all taking part in the production of a Great Mimetic Pavlovian Experiment.